SPOILER ALERT: The below feature contains major spoilers from this week’s issue of Superman. Don’t scroll any further if you still haven’t read it! You’ll have to forgive us if anything we’re about to write doesn’t make sense. Our brains are still recovering from the mind-bending, Multiversal twists of this week’s SUPERMAN #14. You’ve all read Grant Morrison’s brilliant THE MULTIVERSITY, right? It’s the years-in-the-making comic that mapped out the DC Multiverse, world by world. (You can learn more about it by clicking here.) The Multiversity debuted in 2014, and while the DC Multiverse has been mentioned in the years since, there’s been little seen of the diverse cast of characters that Morrison introduced (or re-introduced) over the course of his series… until now. 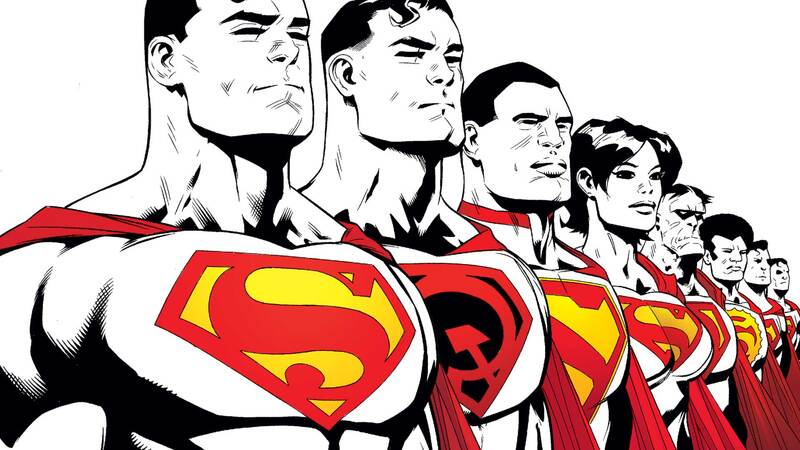 Superman #14 collaborators Peter J. Tomasi, Patrick Gleason, Ivan Reis and Joe Prado brought them back with a vengeance this week, starting with a version of the Man of Steel greatly familiar to readers of the seminal SUPERMAN: RED SON. The recognizably Russian Superman has narrowly escaped a sinister villain named Prophecy and his legion of Gatherers—darkly mysterious creatures who have targeted Supermen across the Multiverse for processing. While their motives for doing so are uncertain, the Gatherers make it horrifyingly clear to our Earth’s Superman what “processing” means—they are consumed. Look, we don’t know where the Gatherers came from, but if they think they can come to our world kidnapping Supermen and get away with it, they’ve got another thing coming. In an inspiring team-up, our Man of Steel partners with his Russian Earth-30 counterpart to put down the Gatherers that have attacked them. But that’s just the start of the excitement. Prophecy’s actions have caused waves throughout the very fabric of the Multiverse, as we learn when a team of heroes shockingly arrive on the scene. A team that hasn’t been seen since The Multiversity! Kenan Kong, the New Super-Man of China! In his first appearance in the pages of our core Superman comic, Kenan is attacked by a team of Gatherers. Unfortunately, he underestimates them…and then this happens. But wait! What’s happening to Captain Carrot? Oh, okay, we’ll show you the final page. But we won’t be held responsible if it melts your brain the way it did ours! B-B-But…Captain Carrot?! What happened to him? And why does he have to be so dang cute? Looks like you’ll have to grab the next issue of Superman when it arrives on our Earth on January 18th to learn what happens next to our favorite high-flying hopper and the rest of his super-powered brethren.